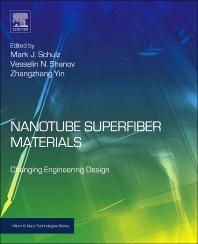 First book to explore the production and applications of macro-scale materials made from nano-scale particles. Potential applications for CNT fiber/yarn include replacing copper wire for power conduction, EMI shielding, coax cable, carbon biofiber, bullet-proof vests, impact resistant glass, wearable antennas, biomedical microdevices, biosensors, self-sensing composites, supercapacitors, superinductors, hybrid superconductor, reinforced elastomers, nerve scaffolding, energy storage, and many others. Nanomaterials scientists and nanoengineers (i.e. mechanical , chemical and electrical) researchers and developers, particular in aerospace, defence and medical device industries engineers and technologists .